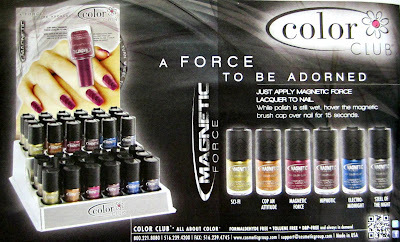 Color Club is joining the ranks of polish companies that offer magnetic shades! The photos below are from an ad I spotted in Beauty Store Business Magazine, so pardon the lack of quality from my photograph of the ad. If you'd like to get a better look at these, I see that they're up on Color Club's web site for pre-order. 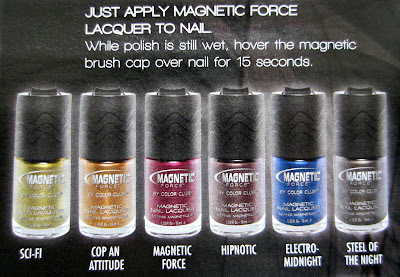 Magnetic Force is the name of the collection, and there are 6 shades. These are priced at $12.00 each, and the magnet is located in the cap. I'm not sure if these will show up at my Ross, but I will definitely be on the lookout for them. I'm looking forward to these, especially that orange looking one! It seems that Magnetics will be trendy this year...Actually I'm not sure the magnet-in-cap feature will be very handy, I'm eager to read some reviews! This will be fun to have magnetics that are easier for many of us to get IF they release them through Sally's that is. But like most collections, Sally's never get enough. I see a run on these before it even gets released! At least these are more affordable! I hate having to buy the magnet separate - I'm looking at you China Glaze. I agree with maisenzasmalto,everyone seems to be jumping on the magnetic polish wagon,the way they did last year to the crackle,LOL! I like these. If it comes to Ross,I will definitely pick them up! 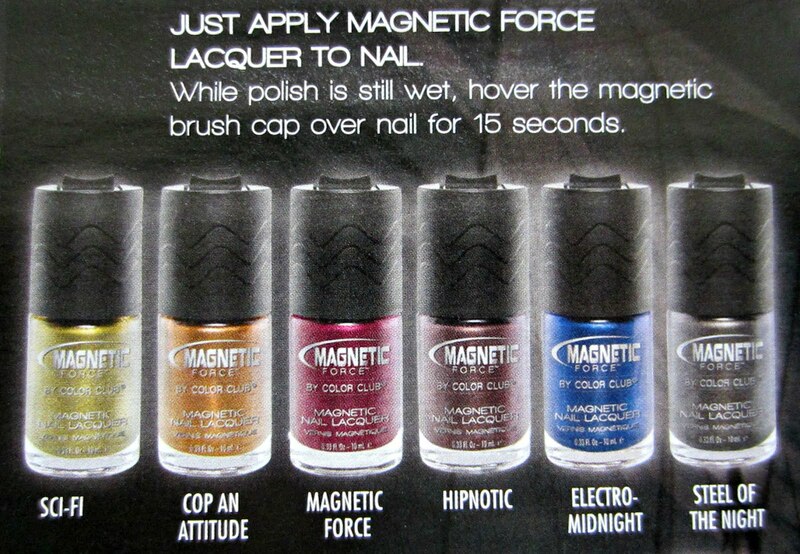 I'm glad they're most magnetic polishes showing up. Hopefully they aren't as expensive as some other brands. Wow! Different bottles from Color Club! That's news to me :D A magnetic collection, sounds nice! It's their first, isn't it? Till now, no any review for this collection.